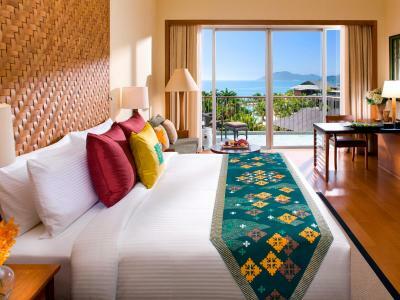 Lock in a great price for Mandarin Oriental, Sanya – rated 8.9 by recent guests! great resort, very beautiful and quit, friendly stuff and beautiful atmosphere, I will return to Mandarin Sanya soon. In a tourist destination that can get overcrowded, the MO Sanya feels secluded and quiet in its very own cove along the bay. We stayed in Sanya for three days and didn't even leave the resort! The hotel facilities are fabulous, 3 pools to chose from, panoriamic view of the sea, even space for everyone to avoid being over crowded in one area, especially having family pools and adult pools separate is a plus. 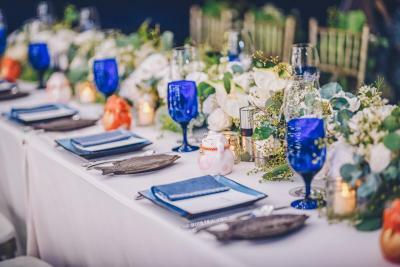 The Fresh restaurant with romantic setting and excellent service from Jason, all staff were generally well trained with good attitude. Breakfast was also enjoyable with a variety of choices for western people. The hotel F&B team even prepared a cake as we celebrated the birthday of my husband during our trip! A welcoming Front Office staff, especially Chloe who was very kind. We had a wonderful time and stay and will chose the same hotel if we go back to sanya! A most wonderful place to relax. Great pools with beautiful views, sand Beach is somewhat limited but nice. The room was beautifully designed, luxurious, great balcony overlooking the sea, well, the palm trees actually. Staff are very friendly and helpful. Particularly the staff members from Nepal were very sweet and welcoming. The gym is spacious and well equipped. Breakfast offers a vast choice of western and Chinese dishes. So delicious. All of it. Private beach, big structure so you have a possibility to use a lot of facilities, the staff was friendly when we ask for a better room even they give us a free upgrade. The structure was really clean and the fresh restaurant really good maybe too expensive with the price . The service charge is always excluded from price and it is an overcharge on the price that it is already high everywhere in the structure! What it is also a shame is that during holiday period they made 3 times the usual price for the room but not really an upgrade on the service! I need to recognize the hotel has great facilities, nice beach area, good gym and kid´s play zone, It´s pity that staff is not on the same level and that´s why our general experience was lowered a lot. My wife really enjoyd free yoga clases and our kids loved swimming pool with beach for them. Everything was perfect. One of the best hotels that I’ve ever stayed in. Great location, not far from city centre. Friendly staff. Excellent breakfast. Enjoyed the beach, the gym and the pool. Everything is wonderful- the beach, the pool, the room, and the people. Highly recommended. One of our top picks in Sanya.Luxury awaits at Mandarin Sanya with its beautiful hillscapes and greenery. Occupying a seaside location with its own private protected coral bay, it features an exclusive spa village with 3,600 square yards' pool space and a recreation center which host a range of activities such as T'ai chi, Yoga, tennis or water sport. 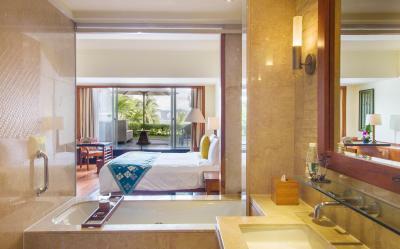 Mandarin Oriental Sanya is a 5-minute drive from Dadong Hai Beach, a 10-minute drive from the downtown area and a 20-minute drive from Sanya International Airport. Offering free parking. 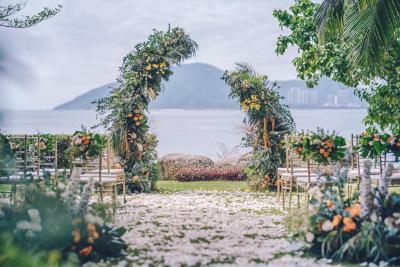 Boasting stunning views of the South China Sea or the property's tropical garden from the spacious balconies or terraces, large rooms are tastefully decorated with classic wood furnishings. Start the day with a calming T'ai chi or Yoga lesson at the state-of-the-art fitness center. 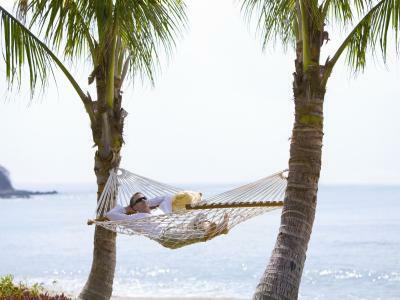 A wide range of leisure activities including tennis, hiking and water sports are available. 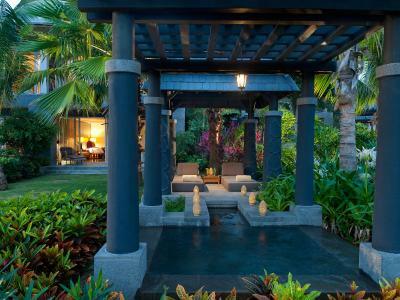 Set amid the hotel's tropical garden, the Spa center offers various treatments ranging from traditional Chinese therapies to western facial and body care. Located by the pool, hearty buffet breakfasts are served at Pavilion. The seafood beachfront restaurant, Fresh offers the freshest and tastiest seafood, prepared in a selection of Southeast Asian styles. The sound of sea waves and the blanket of stars overhead makes it the perfect spot for intimate dinners or relaxed gatherings. As for scented tea, you may go ahead to the Phenix Teahouse. 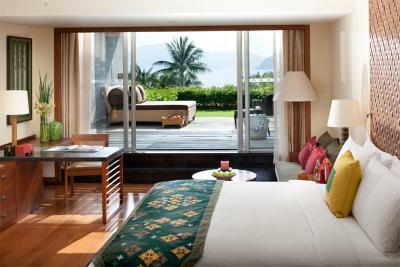 When would you like to stay at Mandarin Oriental, Sanya? Features beautiful views of the gardens from the private terrace. 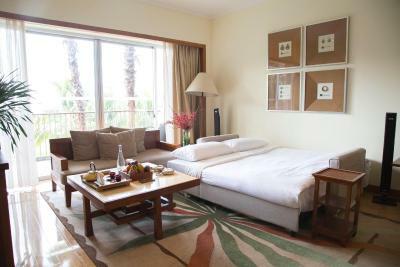 The light-filled rooms feature a spacious private balcony offering expansive views of the South China Sea. 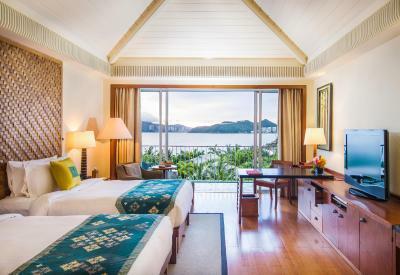 Interiors have an Asian seaside feel with natural timber floors, unique coconut-weaved headboards and artwork inspired by Sanya’s local ethnic cultures. The bedrooms offer a selection of occasional wooden tables and soft furnishings. Providing a spa-like sanctuary, the marble bathrooms are fitted with stand-alone baths, walk-in showers and vanity areas. Connecting rooms are available. 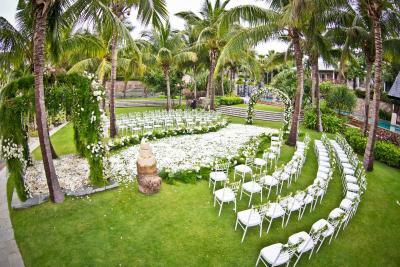 Located on the ground floor and surrounded by the landscaped gardens, the rooms boast private gazebos and plunge pools. There’s also a private terrace only steps from the beach. The interiors feature wood floors, light walls and ethnic artwork. The large bedroom features a king bed, a sofa and selection of occasional tables, as well as access to a walk-in wardrobe. Marble bathrooms offer oversize bathtubs, walk-in showers and twin vanity units. Offering access to a semi-private swimming pool, the spacious rooms have an oriental feel with soft furnishings and coconut weaved headboards. Floor-to-ceiling glass doors open up onto a private terrace furnished with daybeds, chairs and small tables. The elegant marble bathrooms offer oversize baths, walk-in showers and twin vanity units. Opening out on to beautiful decked balconies furnished with elegant sun loungers, the rooms have a contemporary Asian feel with lightly colored walls, wood floors, coconut weaved headboards and a selection of silk accessories. Walls are adorned with artwork inspired by Sanya’s native Lia and Miao cultures. A working desk, soft sofa and walk-in wardrobe are available. Adjacent to the bedroom, the marble bathroom is fitted with a stand-alone bath, walk-in shower and elegant twin vanity units. Located just steps from the seafront, these beautifully designed pavilions offer magnificent views of the South China Sea. The bedrooms enjoy a light, airy feel with wood floors, coconut weaved headboards and artwork inspired by Sanya’s indigenous cultures. Bedrooms feature king beds with quality linens, comfortable sofas and wood working desks. A large balcony is home to a cushion-strewn daybed. Back inside, the spacious bathroom offers an oversize bath, walk-in shower and twin vanity unit. Offering spectacular views of the South China Sea, the one-bedroom suites have a peaceful feel with timber flooring and a neutral color palette throughout. The bedrooms feature a king bed, writing desk and beautifully patterned rug. 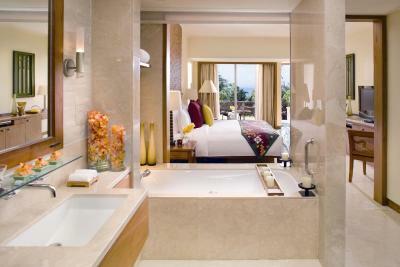 Bathrooms are fitted with an oversize bath, rainforest shower and twin vanity unit. Suites also have small pantries, powder rooms and a large terrace with sofas, table and a dark wood desk. Boasting panoramic sea views, the elegant villas are fashioned from light tropical wood with artwork and furnishings inspired by the local Hainanese culture. A spacious ground floor living room lies next to a twin bedroom with wood floors and side tables. Upstairs, the large master bedroom leads into a marble bathroom with double basins, an oversize jetted bath and a rainforest shower. This room features a balcony, daybeds, a working desk, a sofa and a walk-in wardrobe. The bathroom is fitted with a stand-alone bath, a walk-in shower and twin vanity units. It provides housekeeping service twice per day with water on turndown. 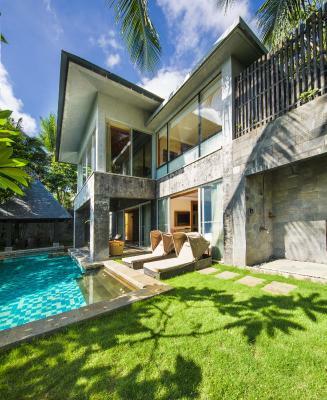 This stunning villa features a private garden with sundeck, gazebo and infinity pool. On the ground floor lies a twin-bedded room and living room. Upstairs, the master bedroom leads into a bathroom with bath and outdoor shower. Nestled into the mountainside, these two story villas enjoy breathtaking views of the resort and South China Sea. Ceiling fans, large windows and ethnic-inspired artwork blend traditional Hainanese design elements with modern touches. Villa guests have exclusive access to The Cliff, where complimentary breakfasts, afternoon tea and evening cocktails are served daily. 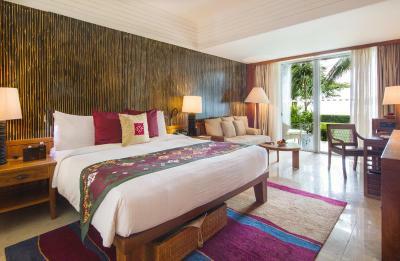 This room type includes 4 separate bedrooms, all featuring a large terrace and a bathtub. Views of China South Sea and tropical gardens can be enjoyed. - dinner for 2 guests once at Haijiaoxuan. This room comes with a private terrace, a walk-in wardrobe and bamboo clothes racks where you can dry swimwear and towels. The marble bathroom features a freestanding bathtub, a walk-in shower and vanity area. It provides housekeeping service twice per day with water on turndown. This twin/double room features a balcony, electric kettle and hot tub. This twin/double room has a balcony, DVD player and hot tub. 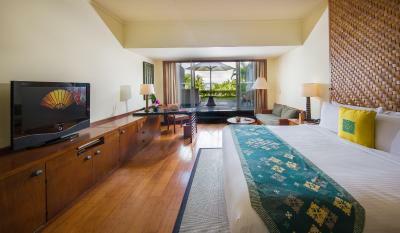 This room features a private balcony offering expansive views of South China Sea. The bathroom is fitted with a stand-alone bath, a walk-in shower and twin vanity units. It provides housekeeping service twice per day with water on turndown. The hotel is located exclusively in a protected core bay of Dadong Hai, where you can enjoy a private and exclusive vacation in the luxury resort. WiFi is available in public areas and costs CNY 100 per 24 hours. 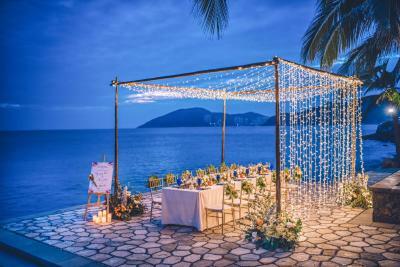 House Rules Mandarin Oriental, Sanya takes special requests – add in the next step! One older child or adult is charged CNY 620 per person per night in an extra bed. 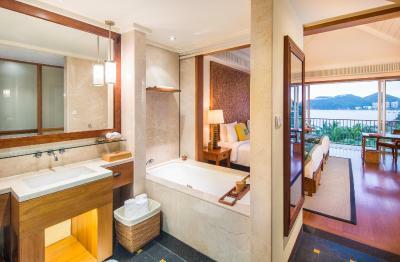 Greatwall Peony Dragon Pacific Jin Mandarin Oriental, Sanya accepts these cards and reserves the right to temporarily hold an amount prior to arrival. 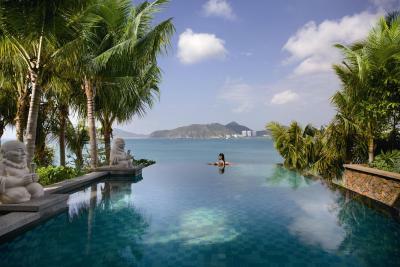 Mandarin Oriental, Sanya accepts these cards and reserves the right to temporarily hold an amount prior to arrival. Please input all staying guests' names when booking more than 10 rooms. Please note that each room rate is based on the maximum occupancy of different room types. 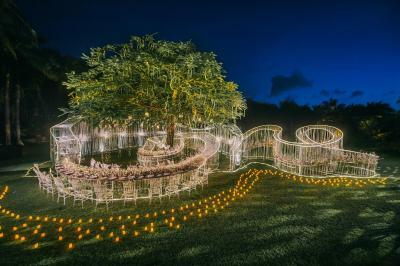 Extra charges will apply if an additional guest wishes to stay in the same room. The hotel provides special gifts for children. Guests who come with children please contact the hotel in advance. - Welcome fruits on the day of check-in. - Free shuttle bus (Resort - Summer Mall), one bus per hour between 14:00 - 17:00. - Free use of fitness center and sauna (6:00 - 22:00). - Free daily recreation and wellness activities for adults e.g. Tai Chi and Qi Gong (based on resort`s schedule). - Special promotion for children below 12 years including: welcome gift upon arrival, children’s amenities i.e. bathrobe and slippers in the room, free use of Kids Club with daily activities and daily care (4 – 12 years old), Kids Passport program with special gift upon departure once all stamps collected. - Free entry to children's club Coco for kids. - A spa voucher worth of 200 CNY. Please note that during public holidays a 100% of total amount within 72 hours after booking is required. The prepayment is not refundable or transferable. Please note that children who are under 6 years old can enjoy the breakfast for free. Additional breakfast fees may apply for children who are aged from 6 to 12. This policy does not apply during public holidays. 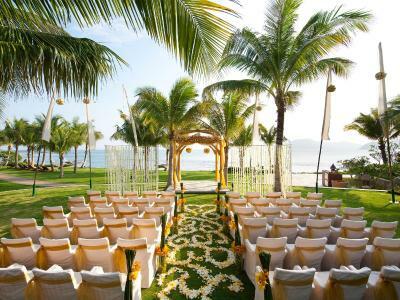 Please inform Mandarin Oriental, Sanya of your expected arrival time in advance. You can use the Special Requests box when booking, or contact the property directly using the contact details in your confirmation.